After a successful five-year mission, NASA's Juno spacecraft entered Jupiter's orbit. Juno is now officially the first probe spacecraft to enter into orbit around Jupiter since 2003, when the Galileo mission ended. Because it's the first of its kind in over a decade, the photos will be the highest resolution images from Jupiter's orbit thus far. Moreover, Juno now has the ability to make new, potentially groundbreaking space discoveries as it remains in Jupiter's orbit for the time being. On its way to Jupiter, Juno had help from "star trackers," cameras with a built-in star catalog that acts as a road map in space. As Juno neared closer to Jupiter's orbit, the probe executed a precise technique to make the orbiting land successful: Juno's special, onboard system conducted a 35-minute rocket engine burn, which essentially propelled the spacecraft past Jupiter's severe radiation belt and into the orbit around the planet. 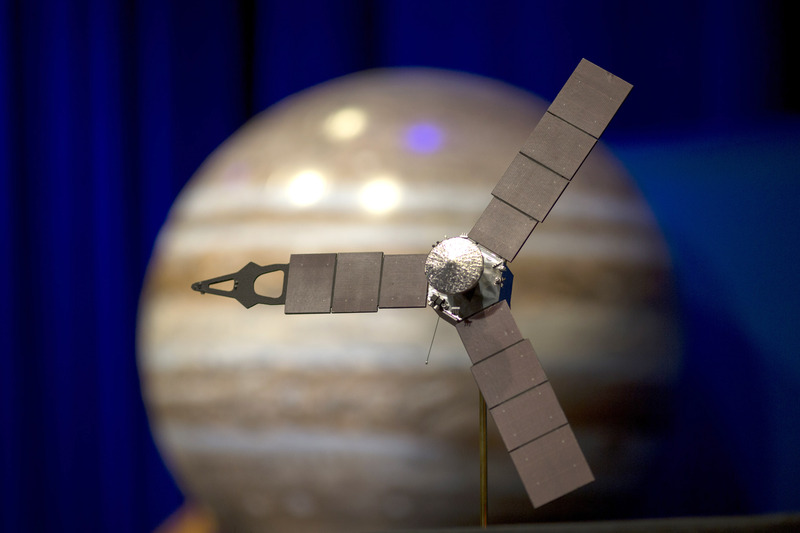 Juno is expected to remain in Jupiter's orbit for 20 months. During its journey, Juno will collect data about Jupiter's interior by exploring the area about 3,000 miles above the planet's top clouds. Juno is also reported to explore Jupiter's outermost auroras. While we're all eagerly awaiting the newest crop of high-resolution photos from Juno, we're probably going to have to wait longer than expected; the probe's cameras are currently turned off to protect its sensitive equipment, but are supposed to turn back on in a few days after July 4, Mashable reported. There are already more than 60 known satellites surrounding Jupiter, but Juno is expected to discover even more moons during its nearly two-year orbiting mission.